-- Select a Size/Color -- 8-12"
Give your kitty lasting fashion with our Nylon Cat Collar in Flamingo Pink. Guardian Gear® Basic Nylon Cat Collars are made of durable nylon with color-coordinated jingle bells and D-rings. Collars have breakaway buckles that release upon snagging to keep cats safe. Nylon Cat Collar - Flamingo Pink Customer Photos - Send us your photo! Posted On 06/20/17 by Ellen C from , FL Yes, Ellen C recommends this product! Posted On 01/10/17 by nancye t from natick, MA Yes, nancye t recommends this product! Great product, very well made and the color is beautiful!!! Posted On 06/02/15 by paws up from , FL Yes, paws up recommends this product! This collar is a purrfect for for my kitty. The nylon is softer than I expected which is even better. No sneaking up on you with the bell..ha ha! Posted On 10/08/14 by Savannah from , Yes, Savannah recommends this product! 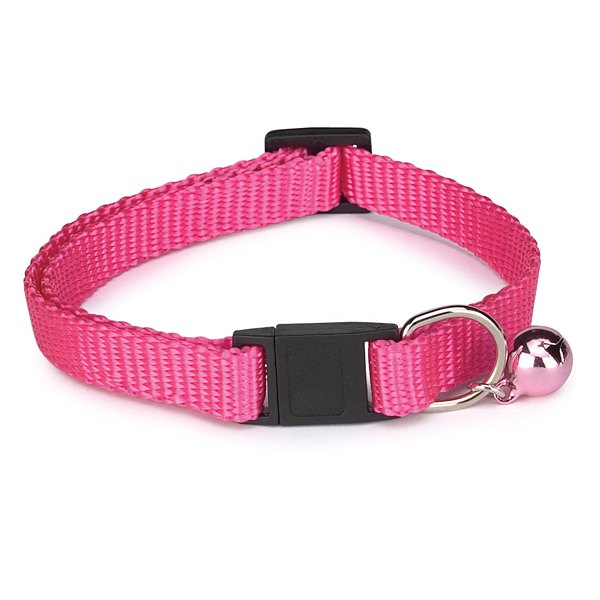 This is a good quality cat collar.I like the vibrant pink color the easy snap open clasp. BaxterBoo is definitely well priced for the great items you sell.